When it comes to providing excellent customer service, big is definitely not better, according to the majority of respondents who participated in a new CreditDonkey survey. In almost all customer-satisfaction categories, consumers are more content with the customer-service efforts of small businesses than with those of big companies. However, better service does not trump lower prices. 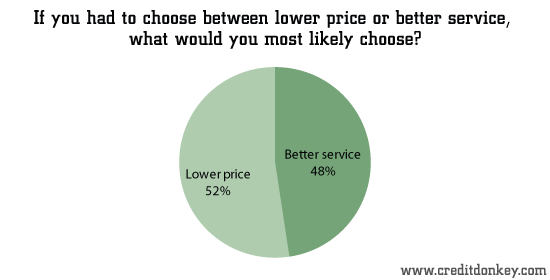 Just over 52 percent of respondents are more likely to choose a lower price over better service – a choice that tends to fall in the favor of larger businesses, which can take advantage of economies of scale. The survey results should serve as a wake-up call for companies of every size. In this high-tech, fast-paced era, people want companies to respond to their concerns and questions with personalized service. Over 80% of our respondents said they did not go through with a purchase because they weren’t happy with the customer service they were getting. 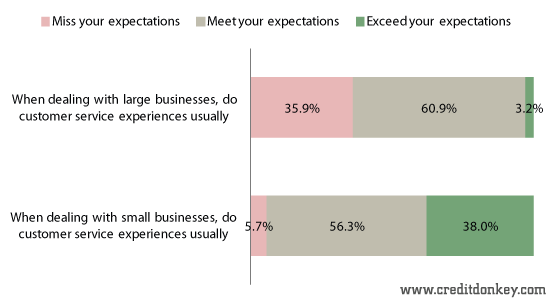 While 94.3 percent of respondents said their customer service experiences with small companies met or exceeded expectations, the rate of satisfaction fell to 64.1 percent when respondents were asked about their experiences with big businesses. However, big businesses did outperform small businesses in one category. 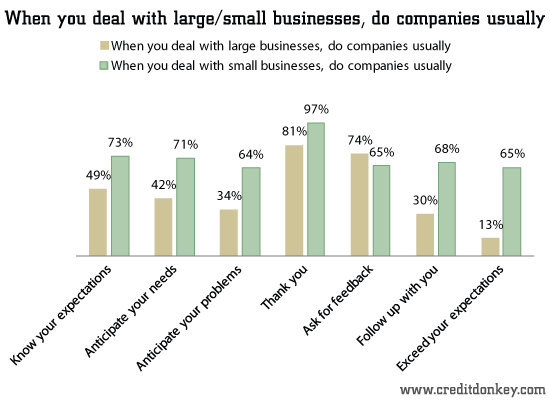 By 74.2 percent to 65.5 percent, big companies are more likely to solicit feedback than small enterprises. Share on Facebook "Survey: Customer Service Statistics"